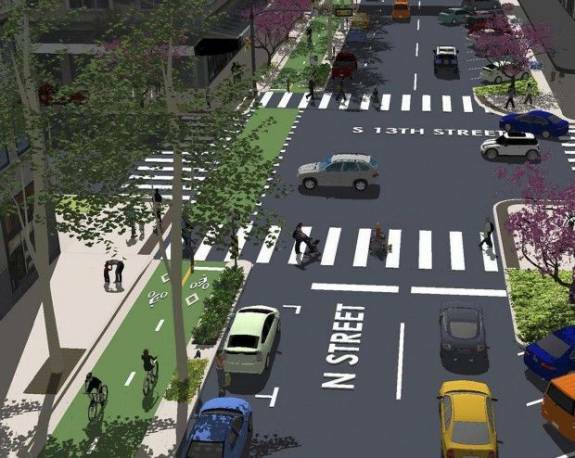 The latest sign that “innovative” bike infrastructure treatments are becoming more and more mainstream: Lincoln, Nebraska, is planning to add a protected bike lane near its downtown. The bikeway would be a section of the roadway, located between the sidewalk and parked cars or shared traffic lanes, separated from vehicles by a raised median containing landscaping, with a single lane going each direction within the bikeway. The bikeway will be painted bright green to provide visual cues to both bicyclists, pedestrians, and motorists. The protected bikeway concept was approved as part of the Downtown Master Plan Update in 2012. The design still needs to be finalized, and needs city council approval. If all goes according to plan, construction could begin this fall. Most of the community response for the plan appears to be positive, though there is some divergence of opinion, among both cyclists and the general public. Experience in other cities seems to bear out safety improvements (Dedicated Bike Lanes Can Cut Cycling Injuries in Half, The Debate About Bike Infrastructure Has Been Settled) and positive economic impacts (NYC Study Finds Protected Bicycle Lanes Boost Local Business, Bike Lanes Offer Growth to Businesses, Safety & Savings to Consumers). Meanwhile at AASHTO, the national association of state transportation officials that produces influential engineering guidelines, time continues to stand still. Elsewhere on the Network today: Twin City Sidewalks says its high time for Minneapolis to get rid of its deadly one-way streets. Better Institutions explains why highway expansions can be very bad news for local streets. And The Greater Marin details how the Bay Area’s policies toward bridge tolls and transit fares lead to more congestion.